For each issue, the cost to fix is estimated by customizable formulas written in C#. Quality is checked both in Visual Studio and in the Continuous Integration process. Code rules are defined with C# LINQ queries. Creating and customizing your own rules can't be easier. Quality Gates are customizable criteria written in C#, that must be verified before committing source or delivering the application to production. Measure, query and visualize your code and avoid unexpected issues and complexity in your project. 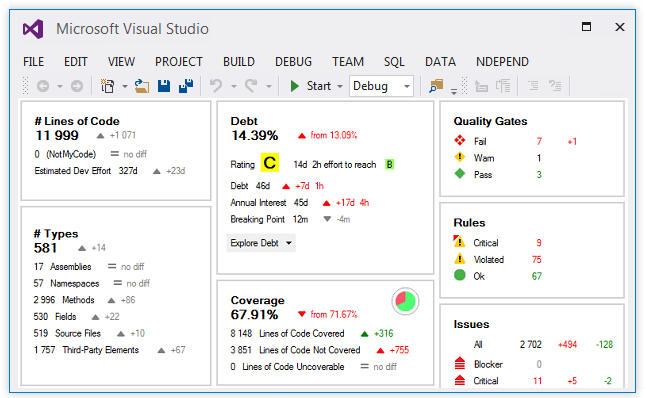 Code, diff, progress, issues, rules status, with NDepend all data can be queried live in Visual Studio. NDepend sheds light on error-prone code and offers visualization tools to focus on code changed. Visualize your team’s progress through custom tailored code metrics displayed on smart trend charts. Browse and understand complex code architecture, and make better structural decisions about your application. NDepend goes far beyond raw numbers and implements the latest visualization discoveries to show your code. 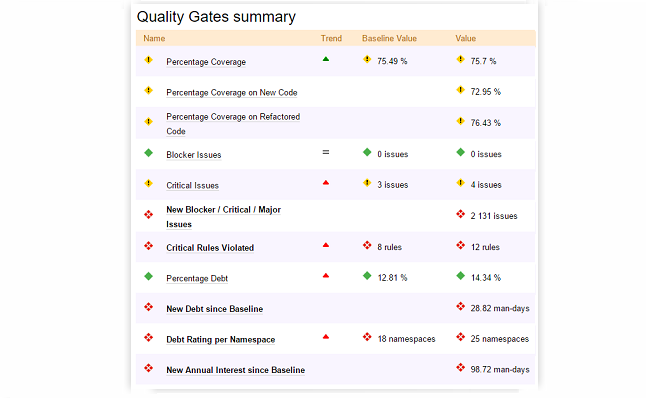 Share detailed reports that reflect the status of your code base with developers and management. Make your .NET code beautiful with ndepend. 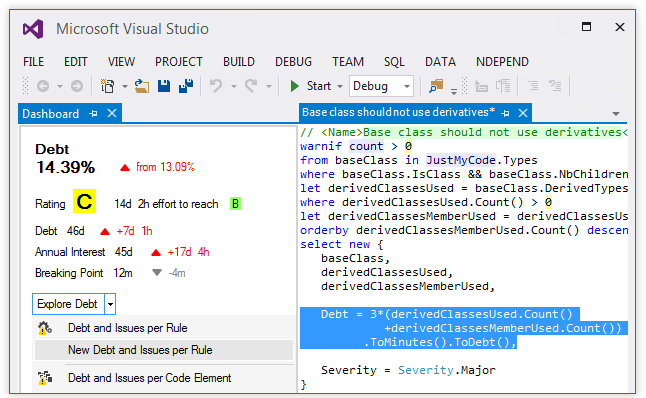 Measure quality with metrics, generate diagrams and enforce decisions with code rules, right in Visual Studio. We don't sell consultancy, we sell software. Our goal is to offer a seamless tool which is easy to get started with and easy to live with. With NDepend, you’ll obtain in-depth reporting within a few minutes after first installation and NDepend results will quickly become essential to take the right decisions. 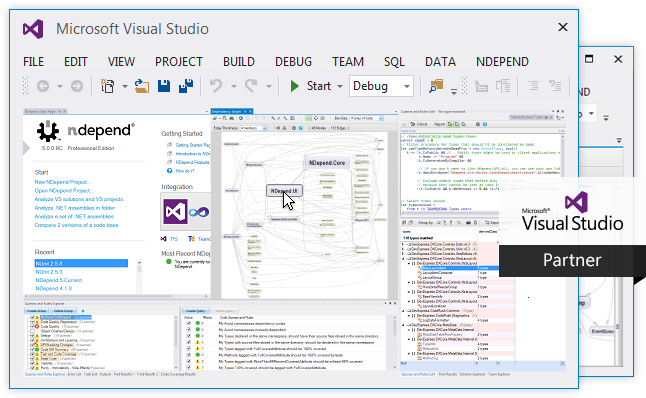 NDepend integrates smoothly within Visual Studio (2019, 2017, 2015, 2013, 2012 and 2010) and Azure DevOps / TFS. Other DevOps and Continuous Integration tools are also supported (TeamCity, AppVeyor, SonarQube...). All .NET profiles are supported, including .NET Core 3.0. More than 8 000 companies provide better .NET code with ndepend. See what professional developers are saying about ndepend. "NDepend is giving me insight into my apps that I hadn't had before. Once I realized the depth and breadth of the information I was looking at, I was like a kid in a candy shop." "Wintellect is happy to recommend NDepend to its clients to use it internally when working on our customer’s code." "Tools like NDepend are required for teams dealing with proper code reviews, examining code when code is idle (like on weekends), or when you have a possible circular reference in play. 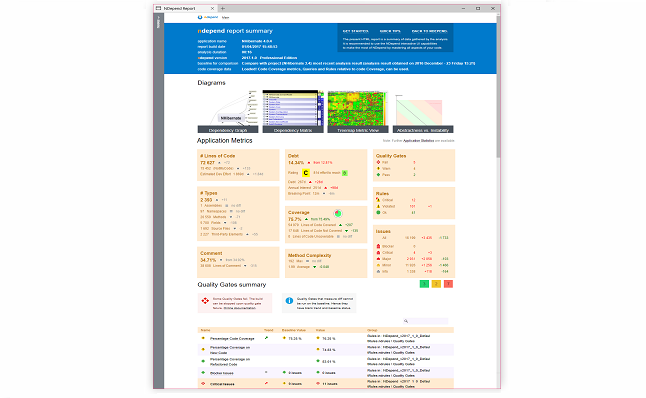 NDepend not only has a great static code analysis tool, but also provides a way for veteran developers and aspiring architects alike to adhere to coding standards along with a way to integrate a company's coding standards into the tool using CQLINQ.This is definitely a tool for advanced developers and one that I definitely recommend to anyone looking to analyze a code base." "NDepend found enough problems in my code. Some of them are really helpful. I like that NDepend found 10 classes which can be changed to structures. Structures are extremely effective from the memory pressure perspectives. This is especially important when we’re talking about mobile applications." We collected some of our favourite writings from our MVPs on how they use NDepend. 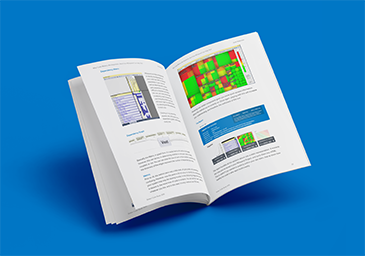 The pages in this 50+ page e-book comes from our wonderful writers who share how NDepend has helped them beat challenges and why they like it so much. Ready to see everything your code has been hiding from you?